This year, our organization, Inclusive Development International, launched the Follow the Money initiative – a new tool to fight land grabs and other corporate abuses. It’s a simple idea, but we believe it has the potential to be a game-changer. Every year, more than 15 million people are forcibly displaced from their land, housing and the natural resources they depend upon to make way for large-scale agro-industrial plantations, hydropower dams, mines and power plants. Rarely are they compensated for what they have lost. A forced eviction is one of the most all-encompassing human rights violations. Victims face impoverishment, homelessness, food insecurity, psychological trauma, reduced access to basic services, and the breakdown of social networks and cultures, to name a few. In most places where land grabbing and forced evictions are commonplace, from the slums of Lagos to the vanishing forests of Southeast Asia and indigenous territory of Central America, victims have little access to justice to challenge their displacement or seek redress after the fact. Advocates working to support these communities face an uphill and often insurmountable battle because the corporate and political elites, who are the storm troopers of the global land grab, are able to operate with impunity. They act unfettered by courts or other institutions, which rarely serve to protect the rights of the poor. Campaigns to make the government or the company accountable so often lead to naught and efforts fizzle at a dead end. But there is often more than meets the eye. 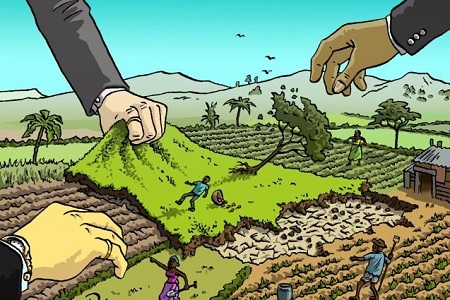 Behind many land grabs is a web of actors: local and transnational corporations and their subsidiaries domiciled in multiple jurisdictions; private and institutional equity and debt investors, including commercial banks, pension funds, insurance firms, and multilateral and bilateral development banks; commodity traders; refiners; retailers; and consumers. These actors all enable and profit from the dispossession of poor communities. Many of these actors are bound by laws in their home jurisdictions, as well as operational policies and codes of conduct that require them to do no harm and respect human rights. Others have visible brands and are highly concerned about their corporate image. But these investment chains — often more like intricate webs stretching across the globe — are almost always invisible to the communities that they impact. And if affected communities and their advocates cannot see and understand the financial web that lies behind the projects that threaten them, they are denied critical information that they could use to devise winning strategies that seize upon points of vulnerability and leverage. Corporations and financial institutions know that the invisibility of this web is their best armor against attack. Invoking age-old business mantras such as “client confidentiality” and “commercially sensitive information,” the financial sector and big commodity buyers jealously guard against public transparency of their business relationships and transactions. As a result, the battalion of corporate accountability advocates has been largely flailing in the dark against these invisible leviathans. And that is where Follow the Money comes in. Upon request from affected communities or their local advocates, we use financial and trade databases and other digital tools used by Wall Street insiders to systematically map the financial backers of harmful investment projects. We then provide that information to the requesters along with tailored advice about potential advocacy opportunities that arise from the investment chain. The concept is straightforward: the more that affected communities know about who is financing a harmful project upstream, and who is buying the goods produced downstream – all the actors making the project possible and profitable, the more avenues open up for them to secure accountability. Most of the actors along the investment chain will have some degree of influence over – and responsibility for – the project that is causing harm. The key is to identify the strongest pressure points along that chain in order to determine where communities and grassroots advocates should focus their energy and resources to maximize the chances of success. The information we assemble is often expansive and complex. Many of the concepts — for example, exotic financing instruments and accountability mechanisms — are completely foreign to impacted communities and often to the local NGOs that support them. Therefore, an important part of the Follow the Money initiative is to explain the material to communities on the ground in a way that makes sense to them, so that they can make informed decisions about their advocacy strategies. We developed the Follow the Money to Justice online resource to help build this financial literacy, which is increasingly critical to defending land and resource rights. It explains how to map investment chains – even without access to expensive licensed databases – by using publicly available information. It also provides guidance on how to collect evidence, get organized and develop tailored multi-pronged advocacy strategies to hold corporate and financial actors accountable. It draws upon the experiences and lessons learned from community advocates around the world who have successfully challenged harmful investments and shaped development in their regions. In 2016, we have piloted the Follow the Money initiative in the Mekong region, where we have already mapped the investment chains of some 15 projects. We have investigated hydropower dams, plantations, mines, special economic zones and other harmful mega-projects in Cambodia, Myanmar, Vietnam and Laos. Our findings so far have repeatedly confirmed our hypothesis that there are strong pressure points, like multilateral development banks, name brand companies and even religious institutions, hidden behind these projects. By identifying these actors, we have opened up new legal channels and advocacy opportunities, which local advocates are now pursuing. We are now gearing up to expand the initiative to other regions. Following the money to fight land and resource grabs is not a silver bullet. Land rights and environmental justice victories are hard-won, primarily and most importantly through locally-led collective struggles, as we just witnessed with the Standing Rock Sioux’s inspiring victory over the Dakota Access Pipeline. But people’s struggles can gain momentum and even unlikely allies when a light is shone on all the actors that enable and profit from harmful investments. Over the long term, this initiative seeks to deter irresponsible investment by increasing the legal, financial and reputational costs of profiting from land grabbing and environmental destruction. We should start to see more rigorous human rights due diligence by financial actors as they realize that human rights violations in their investment chains are more likely to be exposed, and they can no longer hide behind a cloak of invisibility. David Pred and Natalie Bugalski are co-founders and directors of Inclusive Development International. Click here to access the Follow the Money to Justice online resources. Photo: Land grab cartoon. Source: South Sudan.